Sixteen years ago today at 2:20p.m., my Mom (“Muzzy”) lost her battle with cancer. I miss her – her smile and laugh, her caring attitude and her power of prayer. For 2 years and 6 months, I had the pleasure of being her caregiver. I was the privileged one who got to be with her every day. I believe that journey was preparing me for the journey I now face. Up until the last three weeks of her life, Muzzy filled her days encouraging others through phone calls, sending cards and letters and praying. Everyday she took her address book and one at a time prayed for every person in her book. There were times she was in severe pain as the cancer was ripping through her bones and organs and she asked someone to read the names for her – one at a time. Although she didn’t have the strength to hold the book herself – she still prayed for every individual. In so many ways, Muzzy is still here with me today. Sometimes I pass the bedroom door and see her laying there praying with her address book. Often it is her words and attitude that help me deal with the challenges of dementia. Why do I write about living with dementia? Through Muzzy I learned that there is more joy and happiness in focusing on others rather than our illness. With every article I write, I pray that God will use my challenges, emotions and symptoms to touch someone in a special way. To provide caregivers some insight on what their loved one may be feeling. To encourage PWD (Persons With Dementia) that life does not end after diagnosis – clutch every moment you can. To increase awareness of the progression and challenges of dementia – it starts with confusion and frustration and is so much more than memory loss. I find joy in every comment from a caregiver saying how much a post helped them relate to their loved one, in every comment from a PWD saying how much it means to them and also with every blog that is shared. As I pray for each person who comments about the struggles – I am happy to know I can still make a difference. I love and miss you Muzzy. This entry was posted in Adjusting for Dementia, Blogs, Challenges & Bad Days, Dementia, Dementia-Related Illnesses, FrontoTemporal Dementia, FTD, Living with Dementia, Rejoicing with Good Times, Thank You and tagged cancer, challenges, Dementia, Mom, pain, pray, strength on April 12, 2015 by Laurie Scherrer. Recently, when I set out to do a blog on famous PWD (persons with dementia), I was disappointed by the number of people diagnosed with dementia related disease (such as Alzheimer’s) that didn’t speak out. How sad. In my research of over 200 “famous people” PWD, I found exactly 5 who did something to make a difference. The others kept their diagnosis hidden until after their death or care facility placement, when the family announced they had been suffering for years. These five promoted dementia awareness, fought for legislative changes, wrote a book or song and/or became an Alzheimer’s Advocate. 4- Glenn Campbell – After being diagnosed with Alzheimer’s in 2011 he went on to complete his “Goodbye Tour” with three of his children. 5-Patricia “Pat” Summit – The book she wrote, “Sum it Up”, covers her life including her experience being diagnosed and living with Alzheimer’s. She is currently an advocate for people with Alzheimer’s Disease. During the last 18 months, I have met the most remarkable PWDs who are using their precious cognitive time to make a difference. These “Dementia Doers” continue to: promote dementia awareness, fight for legislative changes, write books, blogs or websites, and/or act as mentors to other PWD. I want to say Thank You to MY list of famous PWD, including: Robe rt Bowles, Harry Urban, Norms McNamara, David Kramer, Chris Roberts, Paulan Gordon, Susan Suchan, Karen Francis, Rick Phelps, Truthful Kindness, and Jennifer Bute. Like Rita Hayworth and Pat Summit, most of these people were diagnosed before age 58. This entry was posted in Alzheimer's, Blogs, Dementia, Early On-set Alzheimer’s Disease, EOAD, FrontoTemporal Dementia, FTD, Thank You, Training and tagged actors, advocacy, challenges, Dementia, dementia doers, famous people, promoted on March 26, 2015 by Laurie Scherrer. Before getting diagnosed with dementia I would answer philosophical questions with pat biblical answers – questions such as why God allows suffering in the world. Now I see some of these questions in a whole new light. The questions are no longer philosophical – – they are real. Why did God allow ME to suffer with dementia at only 55? Why did He do this to my family? How can He say He loves me yet allow me to suffer so much when He could have prevented it? I don’t want clichés or religious sounding answers. Through my challenges and doubts, I have come to realize a few truths. 1. Our life is just a speck of light in eternity. So the pain I feel now doesn’t even amount to a pimple in the scope of the world and eternity. 2. God sent His Holy Spirit to comfort me. He said, “I will never leave thee nor forsake thee” – that is showing He loves me. The Holy Spirit is not answering the burning why questions in a way I want them answered but He is comforting my soul. He has opened my eyes to see the world & people in a different way. I have experienced a new relationship with God, my husband, my family, and the beauty that surrounds me. Through dementia chat groups, I have experienced compassion with virtual friends that I never thought possible. To me, FB was a waste of time … now it is my support line. 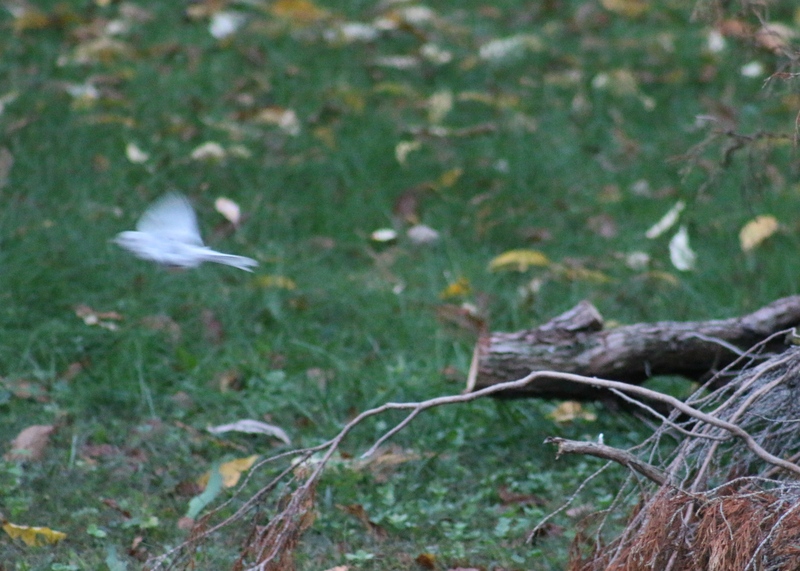 How long has that Albino bird lived in our backyard? Maybe it just came, or maybe it’s been there for years and I never saw it? 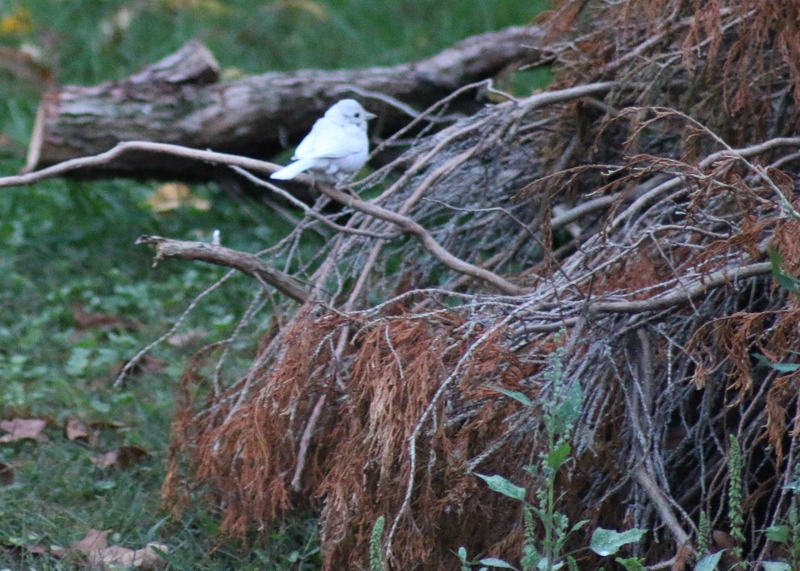 Another rare bird came for a short visit, a spotted fawn walked within 6 feet of me, two kinds of Hummingbirds, beautiful butterflies, an exotic bug – so many new things. Were they always here? 3. On this side of eternity I will never be able to answer why, but I do know God will sustain me through it. He will give me new beauty and love – as long as I am willing to look through His eyes. I try to find something to be thankful for everyday – something new. 4. There are two ways to ask “Oh God Why Me?” Why did God surround me with so much love & beauty? Why did He give me such a loving family? Why does He comfort me? As I look at all God has blessed me with in life, with a thankful heart I ask “Oh God Why Me” – what have I done to deserve this? “Oh God Why Me” really depends on the attitude that I want to portray in life. I choose to be joyful and thankful. This entry was posted in Alzheimer's, Blogs, Challenges & Bad Days, Dementia, Early On-set Alzheimer’s Disease, EOAD, FrontoTemporal Dementia, FTD, Living with Alzheimer’s, Living with Dementia, Rejoicing with Good Times, Thank You, Young On-Set Alzheimer’s Disease and tagged albi, bird, god, Why on November 24, 2014 by Laurie Scherrer.